Protect your personal assets with an experienced business lawyer. One of the most important concerns for any start-up business owner is to limit personal liability. Even more, it’s crucial to select the right business entity in order to make the most out of the potential tax benefits. Every company is unique, so you need a business attorney who has worked with hundreds of companies and has had hundreds of hours of continuing legal education. You need the Chicago-area Law Offices of Marc J. Blumenthal. Mr. Blumenthal has an in-depth knowledge of the Business Corporation Act and the ways to take advantage of its opportunities for Illinois small businesses. You’ll be assured that your entity will be created properly and that all necessary documentation will be filed with state and federal authorities. Because Mr. Blumenthal has represented such a wide range of clients, he sees the opportunities and liabilities that are out there that a small business owner might not notice. His strategic thinking will help you gain a deeper understanding of each business opportunity, as well as the potential risks it contains. To work with an Chicago Business Lawyer who will raise issues you might not be considering, call The Law Offices of Marc J. Blumenthal today at 847-808-7092. We serve clients in Rolling Meadows, Wheeling, Arlington Heights, Schaumburg and the surrounding areas. Mr. Blumenthal will make sure that all of your documents are properly filed with the necessary state and federal regulatory bodies, taking care of the legal aspects of creating your entity. Once you are established, he will provide expert assistance in corporate maintenance, helping you file annual reports with the state and prepare by-laws and corporate minutes. If you are a non-profit, your structure is unique in that you have members, not shareholders, who meet to further your organization’s goals rather than for business purposes. You may also qualify for tax-exempt status, for which you must fit into certain designated categories. Whether you own a business or run a non-profit, you need to make sure all of your legal bases are covered. 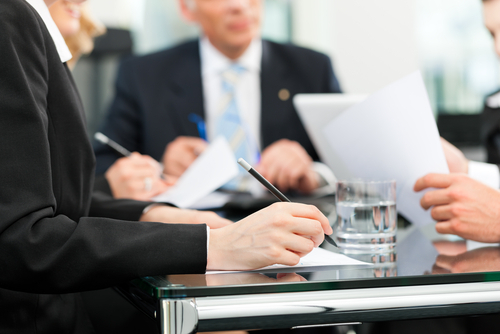 Speak with a skilled and experienced Chicago Business Lawyer today by calling 847-808-7092. All businesses or organizations have information that they need to keep out of the hands of the general public. When you hire an employee, especially for sales and technical staff, there is an expectation that the person will leave the organization with some knowledge gained from working there. In order to keep your sensitive information secure, you need to have agreements in place to keep your proprietary secrets out of the hands of your competitors. When an employee leaves your company, a non-compete clause will prevent them from working for a competitor. While these documents are effective, they are limited in scope and duration. To get the most out of your confidentiality and non-compete clause, and to make sure you’re protected, call Lake County Business Attorney Marc J. Blumenthal today. Businesses have many occasions where all or many of its assets may be transferred either between shareholders or owners, or even outside to third parties. When this happens, a number of complex agreements need to be drafted to allow these changes in assets to occur. Buy-sell agreements typically are transactions between shareholders and LLC members, while asset purchases and stock sale agreements are usually with outside parties who are interested in acquiring a company. Due to the complicated nature of these transactions, you need a business attorney who is well-versed in buy-sell agreements, asset purchases and stock sale agreements. Contracts with customers to establish an ongoing business relationship, including the general terms outlined for each order. Contracts with consultants and independent contractors, such as for those providing technical or computer assistance. The entire relationship with these individuals must be dictated by contract, which will likely include the duties and obligations of each party, the prices paid for services rendered and milestones and provisions for terminating the relationship. Employment contracts with key employees in order to retain important individuals. These agreements should outline the duties to the company, the compensation package, limitations on expenses and confidentiality and non-compete clauses. For some companies, the last item in this list might be sufficient. The number and scope of these contracts could be the difference maker in the overall success of your business. To make sure your legal bases are covered, consult with Business Attorney Marc J. Blumenthal today. He specializes in a wide variety of legal contracts, including those for the transportation and logistics industry. A company may have to raise capital from a bank or other source in order to start or expand its business. The agreements associated with these activities must be memorialized by legal documents, which have far-reaching repercussions. Most lenders will require a security interest in real property, equipment or receivables, documented by a note and security agreement. These documents must be reviewed so that the company’s owners fully know the details of an agreement before they sign anything. For your company to make progress, you need to make sure you explore all of your legal options and opportunities. Work with the business attorney who has the skill, expertise and passion to help your company take off. Call the Law Offices of Marc J. Blumenthal today at 847-808-7092 or contact us online. Mr. Blumenthal helps small and medium-sized businesses across northeastern Illinois, including Wheeling, Waukegan, Hillside, Willow Springs, DuPage County and McHenry County.